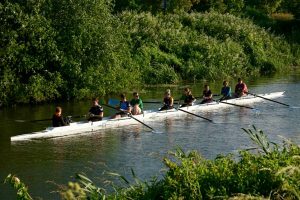 Rowing is the the ultimate university experience. 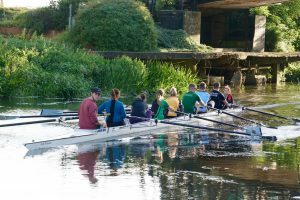 If you want to push yourself to be a top athlete, or make friends and just have fun, we have everything you need at the ULRC. We invite everyone of all abilities to come join us. Come see us at the Sports Fayre on the 19th of September and at our taster sessions on the 21st, 25th and 26th of September. Drop us a message to find out more and take a look at our promo to see what we get up to during the year. Race Report by Niall Cleary. WJ14 2X & W14 singles. Ellie and Elspeth were first to race at 8:40 and clearly learnt from their experience three weeks earlier at Peterborough spring and after a good start took stock of their position at 500m and decided not to race for first position to qualify for the semis against two Rob Roy crews and St Georges College. After taking the lead they again backed off to settle for the final qualifying as 2nd but a spirited fight back by third placed Rob Roy B was a tad worrying for those on the bank but Lincoln held on. 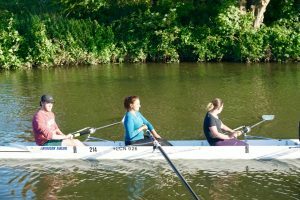 The final was at 19:25 by which time both girls were exhausted having raced in singles too. 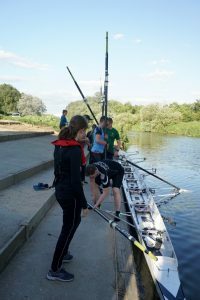 Their start was poor by their standard due to the high winds and they struggled to get back on course and into contention as Star, Isle of Ely and the winners, Rob Roy A moved ahead. I am confident that they would have got a medal if they had not doubled up, but they should proud that the likes for Headington School, Bedford Modern, St Georges College, Wimbledon High School and others did not get as far as them, particularly considering Elspeth is J13. As for their singles. 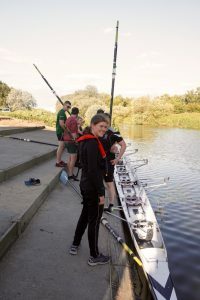 Elspeth was beaten by both strong winds and tough competition of Rob Roy, Lea and Cantabrigians all looking considerably older than J14 (Elspeth remember is J13). Ellie had a great heat with a good start, but the St Ives and Rob Roy scullers pulled back and at 500m Ellie was 3rd but the last 250 was nip and tuck but Ellie pulled away to win by 2.5 seconds from St Ives. 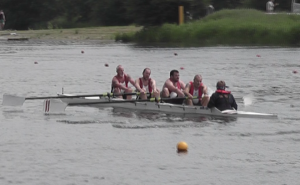 For the semi there are an inordinate amount of waiting on the water due to wind but eventually came third in the semi. Her heat time was faster than the eventual winner achieved in the heats (Rob Roy). Whilst very disappointed she should be proud of her performance. 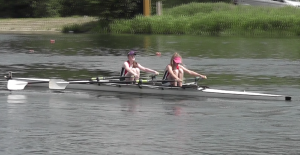 J14 2x & J14 single. 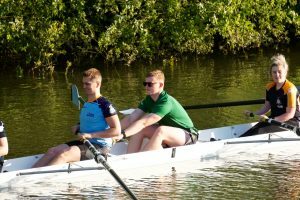 Both Elliot and Will are J13 and new this year to rowing so we were not too sure how they would do. The quick answer is – very well. 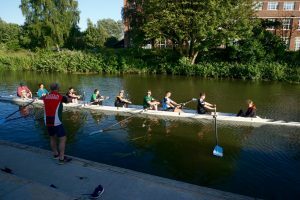 Their heat at 09:16 had a good start that took them immediately into the lead which they tussled with Norwich over up to 500m at which point they were confident of qualifying and came in 3 second behind Norwich. Their semi-final was a debacle with the landing stage marshal not conveying that Lincoln had boated despite them being marked as such. Despite much complaining, apologies and an entry refund this error was not going to be rectified. This was very dispiriting, but I was confident that they were serious contenders for the final but despite this I was very impressed with their performance. Finals next then. Elliot also entered the singles and got off to a great start and qualified for the semis by sitting on 3rd placed Maidstone Invicta. 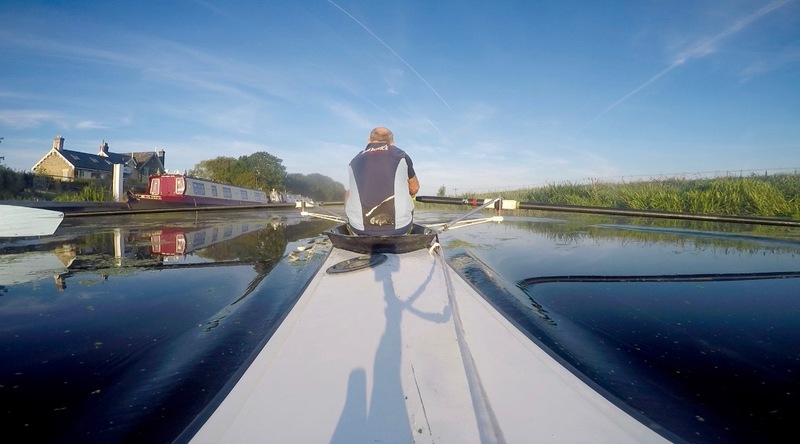 However, this was after the high winds led to a bottle neck at the start and Elliot having to spend 90 minutes on the water in clear blue skies and after a much-needed comfort break and a bottle of water. His semi was a nip and tuck too all the way loosing out to Yarm School by 1 second. 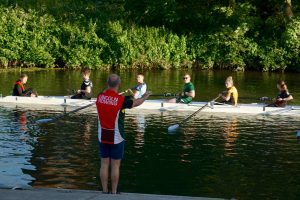 This was his fourth time on the water and again I am confident he would have medalled in the final if it were not for the ridiculous 90 minutes on the water. Again, high hopes for next year in this event. 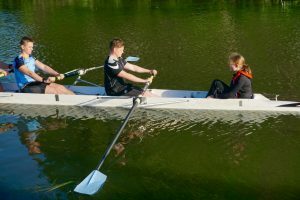 Boris also raced in this event and with a tough draw containing the gold medallist and finalist (Cantabrigians and Yarm School) and Peterborough. A solid start in lane 1 and difficult conditions did not deter Boris from completing this tough event coming in 4th and understandably exhausted. J15 single. Finlay was our sole entrant in this event and had the toughest draw of all our athletes with the eventual Gold (Star Club) and Silver medallists (City of Oxford) getting the qualification positions in his heat with Finlay third and Northwich 4th. The size of these J15 boys is impressive but I am confident Fin will get his own back at next year’s regattas. Overall, I am extremely proud of the performances of each athlete, having given of their best. 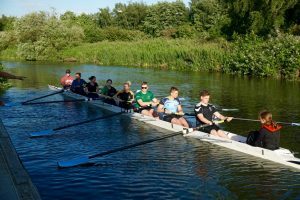 This was an enormous event we have not been to before and after entering a month ago I was beginning to question whether our young rowers would be competitive at such an event against much larger junior clubs and schools. I was hoping for possibly a semi-final so to get three and a finalist (and a likely 2 more) is extremely encouraging and has allowed me to gauge where each rowers competitiveness is. 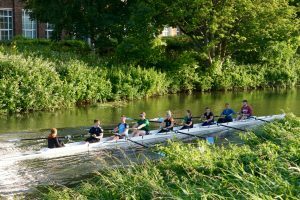 We have a strong albeit small cohort of enthusiastic rowers we can start to build on. 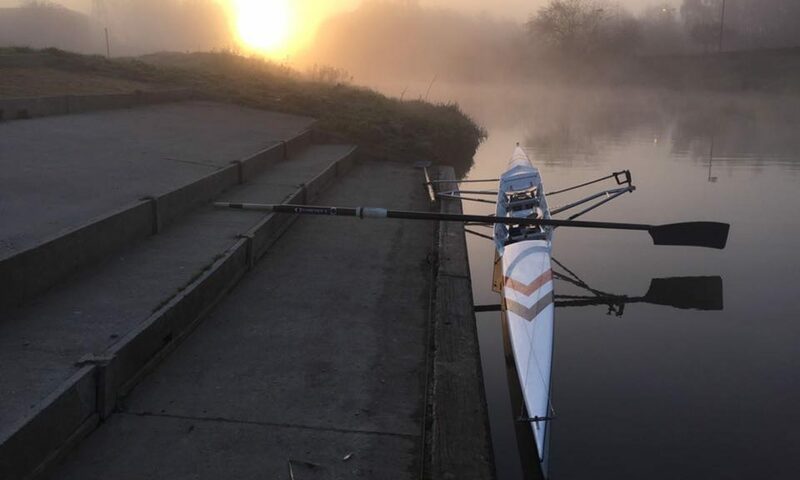 Despite the appalling error our J14 double suffered from I will mark this event for 2019 and plan our training around this. 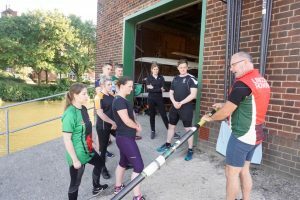 LRC is currently providing support to an RAF 8 from Cranwell who will compete against a crew from the Dutch Royal Military Academy on 6 to 8 July, in the Netherlands. 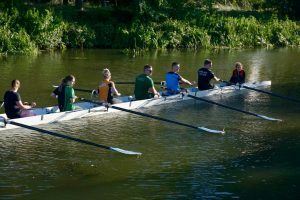 Most of the crew are beginners so this is quite a challenge for them to get racing in 3 weeks! Their first training session was Thursday 14 Jun. Great effort from all – its looking good so far! What a glorious Spring day! 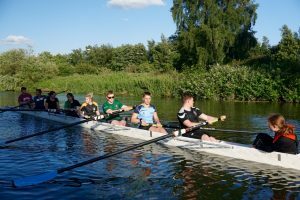 Sunday 3 Jun gave us all a fabulous day’s rowing on the rowing lake at Peterborough Rowing Club with Lincoln Rowing Centre being well represented across the age categories. Ellie Monaghan and Elspeth Jolly performed really well to win their heat in the W Junior 14s double sculls and come 3rd in the final against strong opposition. Rowing in the Men’s singles, Joss Cope faired well, winning his heat and achieving 2nd place in the final. Milan van Heerden was really unlucky to detach his wing rigger in the first few metres of his heat – really good skills for staying dry, Milan!! 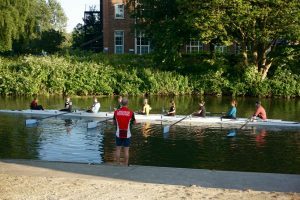 Dean Harrison in the single and the Men’s Masters D 4, Jimmy Sockell, Dean Harrison, John Dyer and Garry Speed coxed by Lewis Colbourne, all raced well, giving their all against some stiff opposition. 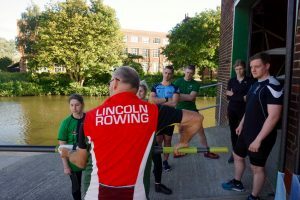 Also competing for LRC were Bruce Margetts in a Lincoln/Peterborough composite 8+ on Saturday, coming a close second in the final, and repeating the fine performance on Sunday, finishing second in the Mas E/F final, once again in a Peterborough/Lincoln composite. 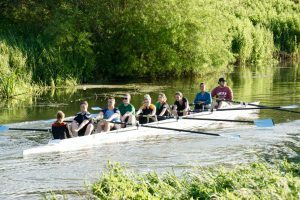 And Jo Canton who won the W Mas D eight final with a great row in a Peterborough Rowing Club crew. 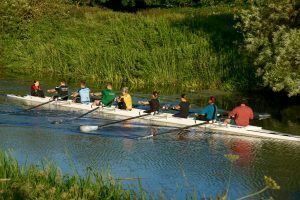 Well done to Tom Westbrook and Louron Pratt who won the Sunday coxless 4 rowing for Bedford RC. 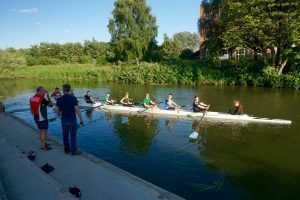 Congratulations to all Lincoln Rowing Centre members who competed in this superb regatta – keep flying the flag for Lincoln! It’s been a long time coming but I’ve finally got round to publishing the new LRC Handbook v1.1. Please read and feedback to me if you have any comments.